I have to admit I love this kind of rustic, close to the earth type of food. My husband will eat it too, as long as it’s accompanied by a large slab of red meat. I could eat just this and be satisfied, however it does make an impressive side dish. 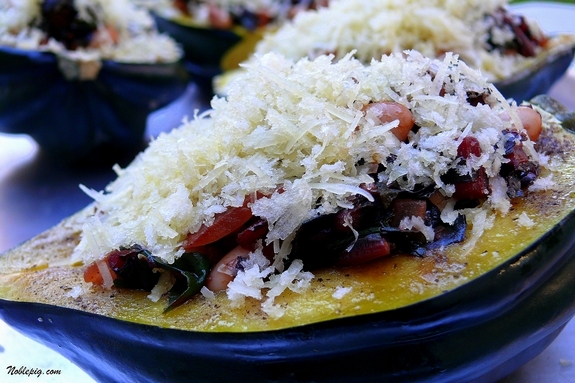 A large platter of these stuffed squash would be striking on a buffet table. The original recipe did not call for the drizzling of agave nectar, but it needed something. I find chard to be slightly bitter and the sweetness of the squash was not enough to overcome its taste. The agave nectar gives your palate an initial sweetness as it bites through the crunchy-salty breadcrumb-Parmesan mixture. 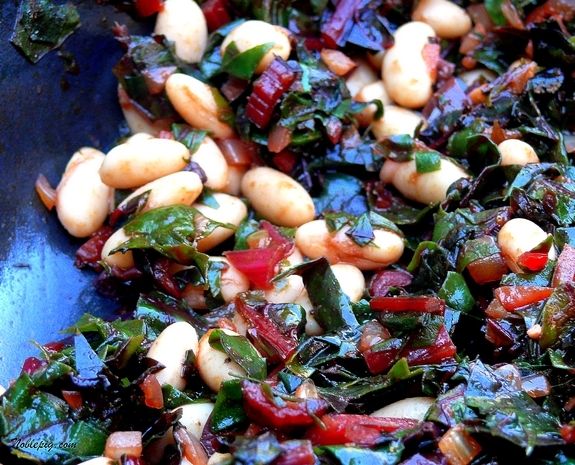 You then get the chard-onion-kalamata olive flavors and you finish with the sweetness of the squash. It’s so good. 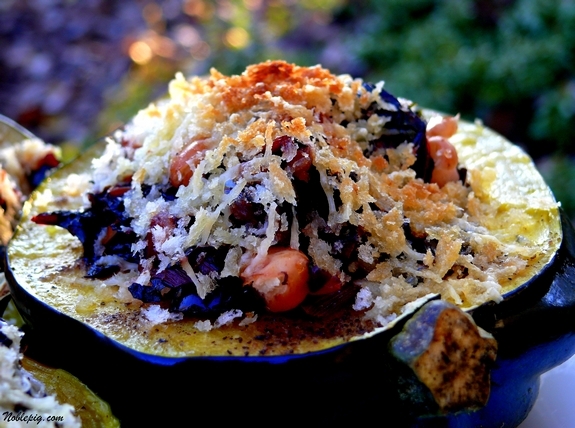 The shape of acorn squash also makes it the perfect vessel for stuffing with this very Mediterranean mixture. As far as a wine pairing, I served it with Pinot Gris, which really held up to all the flavors nicely. Slice the acorn squash in half, scooping out the pulp and seeds. 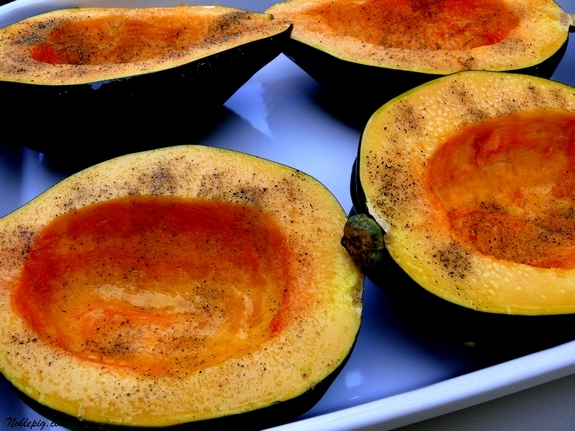 Cut a small slice off the bottom of each squash half so it rests flat. Brush the insides with 1 teaspoon of oil; sprinkle with 1/4 teaspoon each salt and pepper. Place in a 13 x 9 (or similar) microwave-safe-dish. Cover with plastic wrap and microwave on High until the squash is fork-tender, about 12 minutes. Position rack in center of oven; preheat broiler. Combine breadcrumbs, Parmesan and the remaining 1 Tablespoon oil in a bowl. Fill each squash half with about 1 cup of the chard mixture. Place in a baking pan or on a baking sheet. Sprinkle with the breadcrumb mixture. Broil in the center of the oven until the breadcrumbs are browned, 1 to 2 minutes. Remove from the oven and drizzle generously with agave nectar. The leftovers are good too. *Serves 2 Variation: Halve all ingredients (use 3/4 cup beans and 3 Tablespoons each breadcrumbs and Parmesan). There’s a farm near us that sells all of their squash varieties by the bushel. You buy a bushel basket for $25, and you can fill it with whatever combination of winter squash you’d like, from the 20 or more types they grow. Time to get over there, so I can make this dish. Looks de-lish to me–as a meal! My husband is the same way, has to have some big piece of protein to call it a meal! OMG! I love this recipe… especially with the added Agave Nectar. Now the big question is where do I find Agave Nectar? I mean, I live in Texas where there is plenty of Agave. I just need to know where they make it into nectar?!?! I want this for my breakfast! I’m a rustic lover all the way. Let’s face it, it’s the only way real people can eat really good food OFTEN! Not only is this rustic and pretty, it’s NOURISHING, my new word, replacing healthy. It’s in most grocery stores in the baking aisle. Costco even sells it now. I love the idea of the agave nectar to help with the bitterness, very clever. I love this type of food as well. This is exactly my kind of meal…without the slab of red meat, which my husband would also want/need/require. Love the nectar sweetness. what a terrific filling! agave nectar is a sweetener i’ve only recently discovered but quickly come to love. great touch! 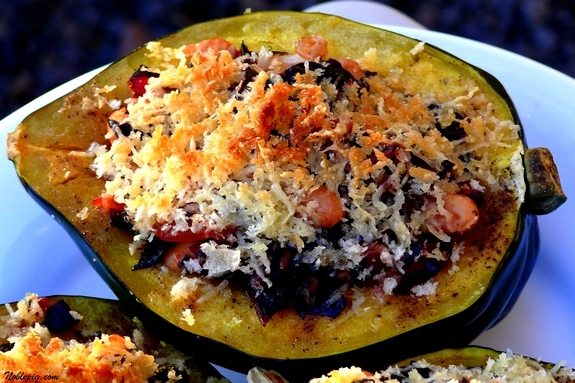 I’ve never stuffed my acorn squash with anything other than nuts before! This is pretty, and count me as another whose husband requires the slab of meat. I don’t have a microwave. Any idea how long I’d cook the squash for in the oven and would I have to make any other changes? I am with you Cathy, I love rustic dishes like this. It not only looks delicious but beautiful too. That looks gorgeous. I still haven’t tried chard, it’s on the List though. I usually bake it for 45 minutes to an hour at 350 degrees. Cover the pan with aluminum foil to keep the moisture in. This looks great! I love rustic foods and could literally live on them (sans the red meat). I have an acorn squash and my garden still has swiss chard growing. I’ll have to check the pantry for beans. I’ve never tried agave nectar before, but it sounds like I should. That is beautiful food, squash is so versatile and good for you. Love agave nectar too! Yes, this would work, however I might try 400 degrees to speed up the process. Wow it looks both beautiful and delicious. Great idea! This just looks so warm and inviting! What a nice fall recipe. I would love the serve this for Thanksgiving. yay for vegetarian recipes – yours are always the best! i’m 100% making these, i wish i was eating one right now. i’m getting behind on my noble pig cooking though – i still have to make that broccoli dish. can’t wait!! Look absolutely scrumptious Cathy. Love this type of squash. Your pictures are wonderful! Such detail- I can see just about every ingredient. Sounds like you have the flavors balanced perfectly. I’ve never used agave nectar and don’t have any…would maple syrup do as well or would it change the taste too much? I too love rustic food like this, so icredible and healthy! I also am a fan of agave nectar, it’s so easy to get now! This looks tasty. Guess I now know what to do with those three cute little acorn squashes currently residing on my porch! 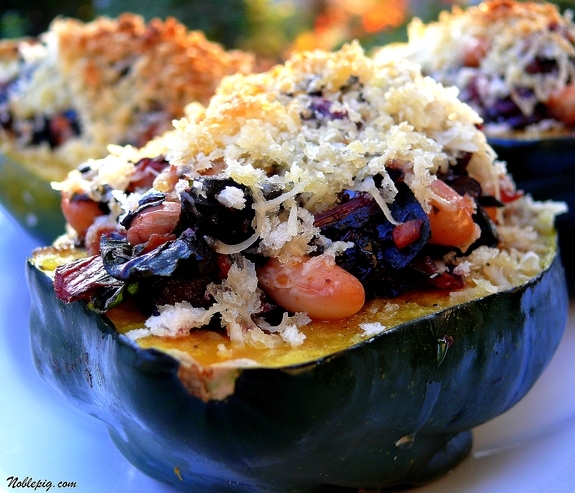 I made some baked squash a few days ago, but yours looks so much prettier than mine — I’m having squash envy! Must try it out: love the addition of agave. I would be very happy to make a meal out of this yummy squash. Love the combination of ingredients and the bit of sweetness to round out the flavors. This looks very good…I could have this for a meal by itself! I really like this recipe, Cathy. I have never used agave nectar in cooking. Perhaps the time has come. I love the combination of flavors in this dish. It’s savory yet you added a sweetness with the agave nectar. It’s springtime in Australia but I can’t wait to try this dish in the fall! I made this last night and am blogging about my variation. I added lots of hot sauce and used beet greens, but skipped the agave nectar, instead drizzling with balsamic vinegar. So good!! Thanks for sharing. Thanks for the “serves 2” variation. I am always on the look out for bean recipes. Too bad I don’t like squash! That looks delicious!